Roof Medic is proud to represent the single-ply Duro-Last commercial roofing system.The custom-fabricated, single-ply Duro-Last commercial roofing system is ideal for any flat or low-sloped application. Extremely durable and easily installed by trained and authorized contractors like Roof Medic, a Duro-Last commercial roofing system can be installed without disrupting building operations. The Duro-Last roofing system is also watertight, highly reflective, resistant to chemicals, fire and high winds, and virtually maintenance-free. Duro-Last Cool Roof Systems – The World’s Best Roof! Over two billion square feet of the Duro-Last PVC roofing system membrane have been installed on all types of commercial, industrial, and institutional buildings throughout North America. Oklahoma is starting to see the many benefits of a strong single-ply roofing system, and Roof Medic is starting to install more and more Duro-Last cool roof systems for our clients. Roof Medic makes sure the your new Duro-Last roof is measured to fit the precise specifications of your roof. Every roof is different and every Duro-Last single-ply roof is measured and manufactured to exact size, accommodating every rooftop penetration. 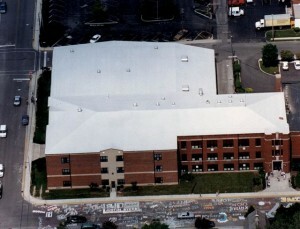 Prefabricating the vinyl roof membrane in Duro-Last’s controlled factory environment, which eliminates up to 85% of seaming that is done on-site during rooftop installation, and improves the long-term performance of the roofing system as well reduces the material waste associated with the installation of most rolled systems. This precise attention to detail ensures an excellent fit and delivers worry-free, leak-proof protection. Roof Medic will work with you and Duro-Last during this process and we can even assist your architect, facilities or maintenance personnel in developing specifications for your roofing project. One of the primary benefits that we see in the Duro-Last roofing system is it’s durability. The Duro-Last roofing system, made from a PVC membrane, is resistant to fire, chemicals, grease, high winds, and punctures, and easily accommodates wide temperature extremes. Duro-Last’s custom flashing components – made from the same vinyl roof membrane as our deck material – resist ponding water and help solve roof problems before they can occur. Plus with Duro-Last’s available Roof-Trak® Protective Walkway System, heavy equipment and maintenance traffic are easily managed. We at Roof Medic know that the process of installing a commercial roof can be quite disruptive to the occupants of the building. Tar and gravel and many other roofing systems can take a considerable amount of time to prepare the old roof and install a new roofing system. When installing a Duro-Last roof, building occupants will hardly know a new roof is being applied, because installation is quiet and safe. Our PVC roof membrane is mechanically-attached to the deck; edges and vinyl roof components are heat-welded together to complete the watertight, monolithic roofing system installation. There are no loud machines, no hazardous materials, no noxious fumes, no hot tar, and no mess. Because it’s made from lightweight vinyl, a new Duro-Last roofing system can often be installed over an existing roof without an expensive tear-off, virtually eliminating dust or falling debris that could interfere with building activities or damage sensitive equipment. Most companies are trying to be as energy efficient as possible and the Duro-Last roofing system is a great solution for this objective. PVC roofing systems make an important contribution to sustainable buildings, and Duro-Last is proud to be a charter partner in the EPA’s ENERGY STAR® Roof Products Program. Duro-Last is a leader in cool roofing solutions, and their Cool Zone® brand addresses the growing nationwide interest in sustainable roofing systems. Of the white, single-ply products rated by the ENERGY STAR program, only the Duro-Last Cool Zone roofing system has retained reflectivity of greater than 85% after three years of weathering (based on ENERGY STAR roof products testing criteria). The high sustained reflectivity delivered by the Duro-Last white PVC roofing membrane is saving significant energy and money for building owners all over the United States. From lowering a building’s energy consumption to helping facilities obtain LEED® credits to reducing the urban heat island effect, the Duro-Last Cool Zone roofing system is a leading sustainable building product. Roof Medic wants to help you save money on your energy costs by installing a Duro-Last roof. Duro-Last is so confident in the durability of their single-ply vinyl roofing systems that they protect commercial and industrial installations with the best warranties in the industry. The standard, comprehensive 15-year full warranty that is available from Duro-Last is transferable, has no exclusions for ponding water, and provides coverage against consequential damages that result from defects in the Duro-Last PVC material. Duro-Last also has 20-year warranties available. Call Roof Medic today at (405)367-6951 to schedule a no cost consultation to see if Duro-Last is the right roofing system for your commercial property.